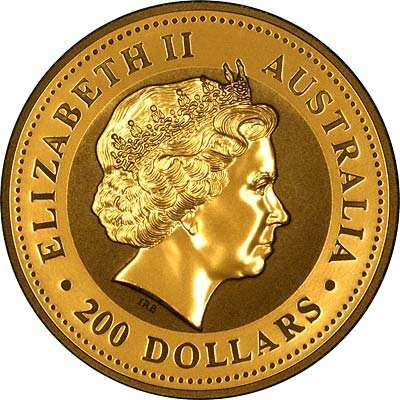 In 1991 Australia started producing "large bullion coins" intended to sell at very low premiums over gold. In the UK, we hardly ever see these, and they are not readily available as bullion coins, however as Britain's leading dealer in gold bullion coins, we have decided to import and carry a limited stock of these coins. 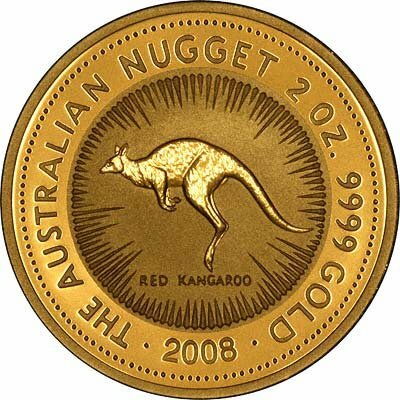 The 2 ounce gold nugget contain 10 troy ounces (62.2070 grams) of pure gold, and is one of the largest regularly produced gold bullion coins. On this page, we indicate the availability of 2 ounce gold nuggets by date, and also "date of our choice". You will notice that for the first year 1991, the denomination (face value) was $500, after which it was altered to $200 bringing it into line with the value of the one ounce coins ($100). We can also offer the 1 kilo and 10 ounce sizes. The following are example prices based on gold at £800 per ounce. Please check current price before ordering. Please note all rates, both percentage premiums and actual prices, fluctuate. Please check current prices and availability before ordering. Why don't we update our prices daily? Please check our Standard Terms for Bullion Coins. USA Airmail $10, Insured Shipping $20.